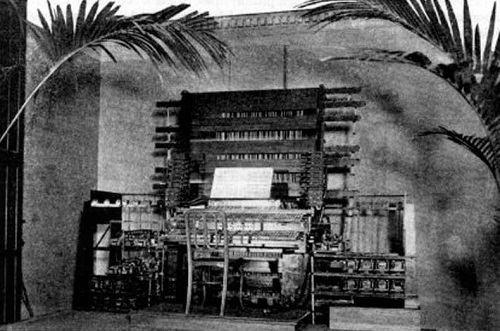 The Telharmonium, also called Dynamophone, was the earliest musical instrument that generated sound electrically. It was invented in the United States by Thaddeus Cahill and introduced in 1906. The electrophonic instrument was of the electromechanical type, and it used rotating electromagnetic generators (and thus was a predecessor of the Hammond organ) to produce electric impulses that were converted into sound by telephone receivers. It was soon superseded by more practical electronic instruments. 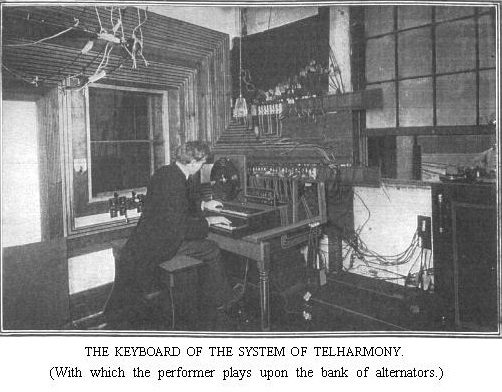 The telharmonium generated its sounds using a system of alternators called "rheotomes." Each rheotome was actually a cog with a specific number of notched teeth. As the edge of the rheotome rotated against a wire brush (part of a larger circuit), the teeth would contact the brush a certain number of times each second, based on the rheotome's diameter. This resulted in the electrical oscillation of a sonic frequency. Several rheotomes, one to generate a fundamental frequency along with several more to produce the fundamental frequency's, harmonic overtones, would be arranged on one rotating "pitch shaft," with one shaft corresponding to one note of the chromatic scale. By operating each dynamo at a precise speed, each disc would produce a current that could be heard as a sound in a telephone receiver. The different tones could be switched on and off in any combination through a piano-like keyboard. 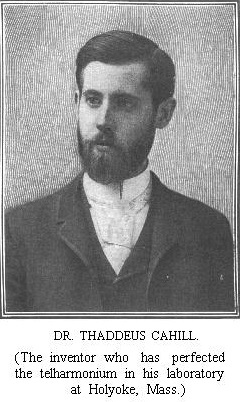 By 1901, Cahill had constructed a working model, and he began seeking financial backing to create a finished machine. With it, he said, he would provide musical concerts that would be delivered over telephone wires to restaurants, bar rooms, or people’s homes. The final model, which employed 145 separate electric generators, was completed in 1906. Weighing in at 200 tons, the giant instrument was 60 feet long, had multiple keyboards and controls, and required at least two players. 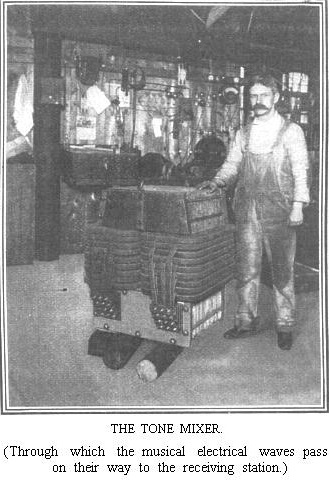 Cahill made two more Telharmoniums, finishing the last of them in 1911. 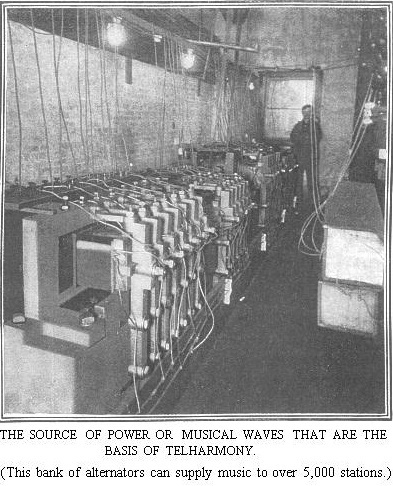 The last Telharmonium, an even larger system, was installed in a special performance room in New York City from which Cahill and his investors planned to offer Telharmonium music concerts to hotels in the area for a fee. Unfortunately, the instrument interfered with telephone service in the area, aggravating local residents. It was played periodically through about the time of World War I, when it was finally dismantled. No recordings of Telharmonium music are known to exist, and no Telharmonium survived after about 1920. Do you have content, to add, about the Telharmonium or associated topics? Please feel free to Share it, here!